We like to make an initial appointment to see a bride in her home in order to discuss her plans on any day or evening of the week to suit her needs. We take great care to ensure that the flowers will complement the design and colour of the bride’s dress and those of her bridesmaids. We recognise that flexibility on our part is essential and designs will range from rustic simplicity to grandly traditional, or bold and modern so as to provide for the widest possible range of personal needs. 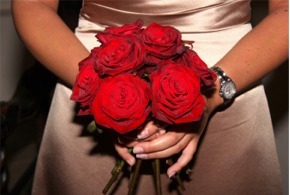 Our service also extends to silk and dried flower arrangements. We order fresh flowers of exceptional quality from Covent Garden or from local sources for the more unusual material from gardens, hedgerows and woods when required. Whatever the requirement you may be assured of the highest standards. In planning for the floral arrangements we take into account factors such as cost, venue, timing, lighting, numbers attending, seating arrangements etc. as we believe the smallest detail should be taken into account in order to achieve a successful result. If you are stuck for inspiration or would like to discuss the ideas you already have, I would be very happy to come and discuss them with you. Our initial consultation and estimate are undertaken completely without obligation on your part. On our prices page you will find some idea of the costs we charge.